Stencils Give An Old Wooden Chair A Boho Chic Look! Good morning, my Cutting Edge Stencils friends. Chairs are hospitable and versatile so a simple chair makeover is a worthwhile DIY project. Whether you have an old chair sitting around or you picked one up a local flea market, a chair makeover is easy and affordable. All it takes is a little bit of paint, our furniture stencils, and a dash of creativity. We are excited to share how one creative blogger gave an antique wooden chair a boho chic look using the Peacock Feather Furniture Stencil. Come take a look! We’d like to welcome back Meredith, the creative DIYer and furniture makeover queen behind the blog Arts and Classy. Meredith has been super busy stenciling furniture lately and you read about her coffee table and end tables projects on her blog. One of her hobbies includes finding curbside trash and turning them into DIY treasures. 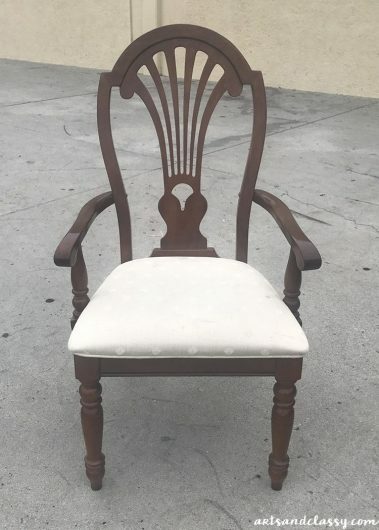 Recently her friend gave her an antique wood chair to makeover. Here is what it looked like before. The antique chair was dated and worn but Meredith had a plan. First, she gave it a fresh coat of paint using her own DIY chalk paint in Hidden Sea Glass (Behr Paint color). 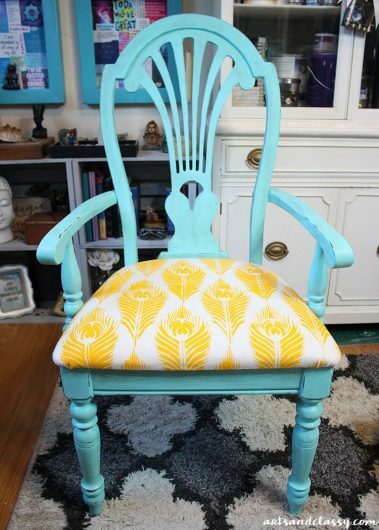 You can read all about how she made her own chalk paint and painted this chair on her blog. We’re going to focus on the stenciling. Meredith is a huge fan of our stencils. She had previously used our Peacock Feather Accent Pillow Stencil on a fabric project. Since our stencils are reusable, Meredith made sure she cleaned off the stencil so she could use it for another project. 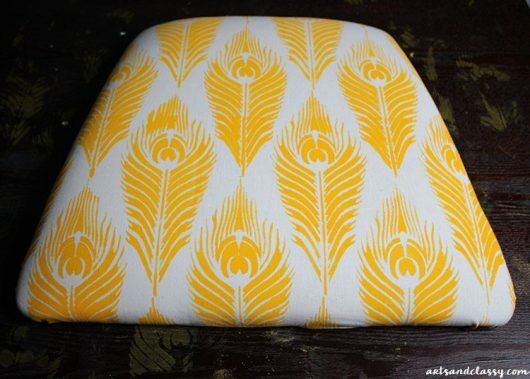 The cushion for this chair seemed like the perfect time to reuse a stencil pattern. Meredith had some fabric left over from a previous pattern. She ironed out the wrinkles and positioned the peacock feather stencil pattern on the top of the fabric. 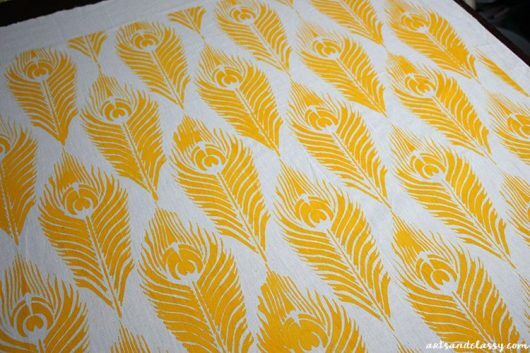 Then she painted the pattern in Jacquard Fabric Paint’s golden rod yellow. If you’re trying to recreate this, pour your paint onto a plate or paint tray. Dip your small dense foam roller into the paint and then roll off the excess paint onto your folded paper towel until the roller looks almost dry. 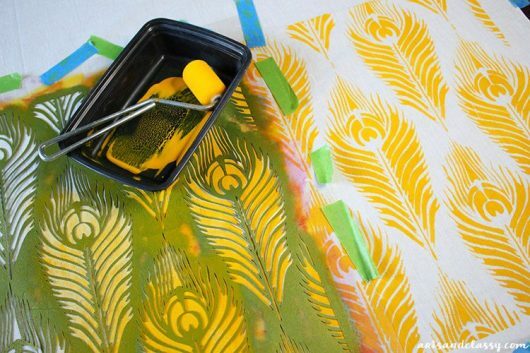 The key to stenciling is using as little paint as possible. Too much paint will cause the design to bleed and smudge. Painter’s tape can help hold the stencil in place. To finish the project, Meredith used a staple gun to attach her stenciled fabric to the cushion part of the char. Our visual fans will love this quick tutorial that Meredith put together sharing how she stenciled the fabric for this chair. Tell us: What stencil pattern would you use on a furniture project? Leave us a comment below! Haven’t had enough stencil fun? Shop our large stencils and add style to your home today. Create a Craft Project with a Flower Stencil!